Princess Cruises is sailing into the festive season following a fleetwide installation of Christmas decorations in preparation for holiday departures. 17 ships sailing over the summer period will collectively be adorned with 15,000 tree decorations, 7000 cabin mailbox adornments, 1000 metres of lights, 123 Christmas trees and 24 wreaths. Onboard Majestic Princess – Princess Cruises’ newest and largest ship to call Australia home – more than 1780 Christmas stockings will bedeck guest areas. And, across each voyage guests will feast on 450 kilograms of ham, 1000 kilograms of turkey, 144 gingerbread houses, 8000 puddings, 3000 bottles of Champagne and more than 120 litres of eggnog. 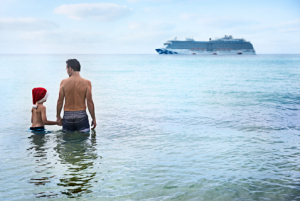 In December more than 27,000 people are expected to cruise on one of Princess Cruises’ four ships currently based in Australia. Ships include Majestic Princess, Sun Princess, Sea Princess and Golden Princess, each set to sail on varying itineraries our of Sydney, Brisbane, and Melbourne. Princess ships will host a series of special events throughout the holiday period, including gingerbread house decorating contests and Christmas card making for the kids, as well as turkey carving demonstrations and kids’ carols shows for the adults. Children onboard will enjoy a surprise visit from the ship’s resident Santa Claus – and on Christmas Eve can leave out cookies and carrots for the big man in red and his reindeer.